Selecting books that spark students' interests and make them want to discuss and respond is a key component of successful literature circles. Under "How Teachers Choose," we offer guidelines on identifying, obtaining, and working with books for literature circles. Under "Student Choice" you'll find suggestions for helping your students learn to make good book choices for themselves. Click on "Good Books for Literature Circles " for links about sources of great books for literature circles. A good literature circle book touches something within the reader's heart and mind and compels response. You can use some fairly simple criteria to help you find such books. For example, consider these three questions: "Does the book succeed in arousing my emotions and will it arouse children's emotions? Is the book well written? Is the book meaningful?" (Monson, 1995, p. 113). * In short, a good literature circle book has substance -- something worth talking about. In addition to content, consider a book's layout -- number of pages, size of print, inviting space on the page, use and placement of illustrations. These can be crucial deciding factors for students as they choose a book. If the configuration of pages and print is too overwhelming, a book may seem insurmountably difficult even though its content is riveting. As veteran teacher Dan Kryszak says, "You can tell a well laid-out book, as if it says, 'Hey, I've got a great story. Come on in and relax and enjoy it' not 'Here it is -- BAM. Hurry up or you'll never finish!'" Compelling content -- action, suspense, dialogue, humor, controversy: Most teachers look for books in which the story blasts off from the first few pages. Books with action and conflict automatically prompt response. As Janine King said, "If students disagree with what the characters are doing, they'll talk. If they think the character's making some bad choices, they can get pretty riled up and want to talk about that, too." Realistic characters: As readers, we all want characters we can come to know, characters so real that they could walk down the street with us. Picture books with strong, colorful illustrations that support the story: Illustrations can be as important as story content in sparking response, particularly for beginning readers. * Monson, D. (1995). Choosing books for literature circles. In B.C. Hill, N.J. Johnson, & K.L. Schlick Noe. (Eds.). Literature circles and response. Norwood, MA: Christopher-Gordon Publishers, Inc., 113. It's important to accept that the first few times, you may not be able to find "perfect" literature circle books -- sometimes you just have to start with what you can find. Think about your goals: First grade teacher Vicki Yousoofian's goal for her first round of literature circles was "just to start." To begin, Vicki chose the material she had closest at hand: the basal anthology. She found a story that would reinforce reading skills she was already teaching. On the other hand, Adam Brauch knew his school library had a class set of Bunnicula (1979) by Deborah and James Howe, so he chose that. He wanted something funny that he knew his third graders would enjoy. His goal was to entice his students into literature circles through humor. Because Janine King's goal was for her middle school students to begin their discussions with a substantive book right off the bat, she took time to find just the right book before she started literature circles. Janine selected Mildred Taylor's Roll of Thunder, Hear My Cry (1976) because she knew it had the depth and drama she sought. Begin with what you have in your classroom: Sometimes it's not your goals that drive your choice of books. You may start with a story in the basal anthology or it may be one book that everyone reads because that is what's available or simply because there are enough copies for everyone. In order to begin, you may have to settle for a less-than-perfect book. Find out what is available in your school: Your teaching colleagues and the school librarian can be excellent sources of good books that have worked in other classrooms. One of the most effective book-finding strategies is "Walk the School." Gather your colleagues and literally walk through your school, looking in bookshelves, opening closets, scanning the entire building for books that surely are there but have been long overlooked. You may be surprised at the literature treasury you unearth. Professional Books Many professional books include book lists. You might start by looking through a text you or a colleague used in a children's literature course. In addition, the Literature Circles Resource Guide (Hill, Schlick Noe, and Johnson, 2000) provides sample book lists and a database of over 2,000 books for literature circles is searchable by theme, genre, time period. The annotated bibliography in Literature Circles and Response (Hill, Johnson, & Schlick Noe, 1995) offers high-quality books organized by themes. The list includes picture books, easy chapter books, novels, informational books, and poetry. You will also find helpful suggestions in professional books that are not necessarily written about literature circles. For example, Regie Routman's Invitations: Changing as Teachers and Learners K-12 (1991, 1994) and Conversations: Strategies for Teaching, Learning, and Evaluating (1999) provide extensive lists of children's and young adult literature categorized by grade level (p. 103b-166b). A effective resource for multicultural literature is Violet J. Harris's edited book, Using Multiethnic Literature in the K-8 Classroom (1997). In addition, an excellent resource for picture books is Ruth Culham's Picture Books: An Annotated Bibliography with Activities for Teaching Writing (1998). A useful computer resource for book selection is The Horn Book Guide, Interactive (1998), a CD-ROM listing over 29,000 short reviews of children's and young adult literature from The Horn Book Magazine. Journals Professional journals that provide book reviews include Book Links (American Library Association); The Horn Book Magazine; monthly columns in TheReading Teacher and Journal of Adolescent and Adult Literacy (International Reading Association), Language Arts (National Council of Teachers of English), and The New Advocate (published by Christopher-Gordon Publishers, Inc. 800-934-8322). Does this sound familiar: "What is a good third grade book?" Or how about this: "I teach sixth grade, and my students read anywhere from first grade level through high school. How am I going to find books at all those levels?" You have to let go of the idea that you must find books written specifically for a given grade level. Remember that one of the benefits of literature circles is that they allow students to work together to understand and enjoy books. Therefore, students can respond to books in literature circles that aren't necessarily right at their independent reading level. Pursue books with a range of difficulty the same way you look for any book -- talk with colleagues and your students, look at the books themselves, help your students learn to choose books that work for them. Comb all of the book resources suggested. And try out the book sets that we recommend. At each grade level, we have included books that are easier to read and also more challenging. Students reading picture books or short stories may be able to read the entire selection before they discuss. For novels, a good rule of thumb is to have students discuss at three points in the book – after the first third or so, somewhere near the middle, and at the end. You can divide the books into reading segments – or you can guide students to look over the book, taking into account how many discussion days you have set aside, and divide up their book themselves. This will involve a couple of focus lessons: How to identify good “discussion points,” how to come to agreement on how much each group member can read at one time, how to figure out logical stopping places. Beginning Readers Young students can accomplish the reading in a variety of ways. You can read the books with them during shared reading time. Then, they can read the books a second time with an adult volunteer, older reader, or at home with family members. Students can also read with a class partner. By this time, they have had several exposures to the book and it should be fairly familiar. First graders do not need to be able to read a book on their own in order to talk about it. Listen to the book on tape and read along. Search bazaars, garage sales, and bookstores that sell used books. Here are some suggestions for guiding students to select their literature circle books. The process of choosing a book to read is remarkably similar across grade levels -- first graders follow pretty much the same procedure as do middle school students. Teach Students How to Make Good Book Choices We've all had students who chose a literature circle book for the reason that Hannah did: "Out of all those books, it was the only one calling my name." Students may need guidance to select books that call their names as well as books that they can read. Help students understand that making effective choices goes beyond finding the shortest (or longest) book. Selecting a book that holds your interest and gives you something worth discussing with others is part of becoming a critical reader. There are several simple strategies for students to use as they choose a book that's right. Commonly known as the "five finger rule" or the "rule of thumb," one strategy is to pick up a book and begin to read anywhere. If you come to a word or place in the text that is hard, put up a finger. If you get to the end of a page or two and all five fingers are extended, the book may be too difficult for you. Another process (Ohlhausen & Jepsen, 1992) guides students to identify books that are "Too Easy," "Just Right," and "Too Hard." During their book talks, many teachers set the books on the chalk tray or on a table, arranged according to difficulty. You do not need a readability formula to tell you how difficult a book will be for your students to read. Examine it. Flip through the pages. Look at the language, typeface -- even the size of the print. Ask other teachers and students what they would say about its level. These informal -- and quick -- assessments can give you the information needed. Guiding students to make good choices for themselves -- and then honoring those choices yourself -- is not always easy. If we decide what books are at a child's "reading level," then we're taking away choice. Sometimes, you may just have to trust a child to make a good choice -- and then support her as she reads. Provide Choice Most teachers discover that the best way to engender ownership and "buy in" for literature circles is to give students choice in the books they read. No matter what books you have chosen, scrounged, or discovered -- allow students to select the one they want to read. A key element of choice is offering a range of books that fit what you know about your students' abilities and interests. If your overall goal is for students to delve deeply into a book and construct meaning collaboratively with others, you'll probably want the groups to be heterogeneous by gender, experience, and ability -- keeping students' choice as a high priority. Introduce Books Through Book Talks Informal introductions invite students to select and read a book by sharing just enough information to entice them without giving anything away. You might read aloud a short selection to give students a sense of the language and story. Better yet, ask students who have already read the book to give the book talk. This will be easier and more effective later in the year as more books have been read in your classroom. Build in Time to Preview the Choices Many teachers provide time for students to sample the book choices as they decide which one they want to read. If you give the book talks in the morning, for example, you might leave the books out during recess and lunch so that students can do a "hands on" perusal. Allowing enough time at this point is an effective way to honor your commitment to choice. 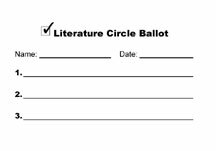 Students Select First, Second, and Third Choices When students are ready to choose, distribute either pre-printed ballots or small pieces of blank paper on which students write their name and list one to three book choices (see ballots below). The key here is to help students understand that their first choice is the book they most want to read; their second and third choices should also be books that sound interesting and that they would be able to read if they cannot have their first choice.